I named Cristina Santiago-Rivera’s Chocolata and Strawberry Charlotte two of Manila’s Best Desserts 2007. If I had a list for 2008, her two new cakes would’ve made the list again. She strikes me as a person who understands that [a] dessert is a carefully orchestrated sequence of taste sensations and surprises, pleasures that pique and surprise the palate. Such understanding propels her creativity and produces a new magnum opus times two. The first is the Midnight Hazelnut Crunch, a play on the popular Plaisir. 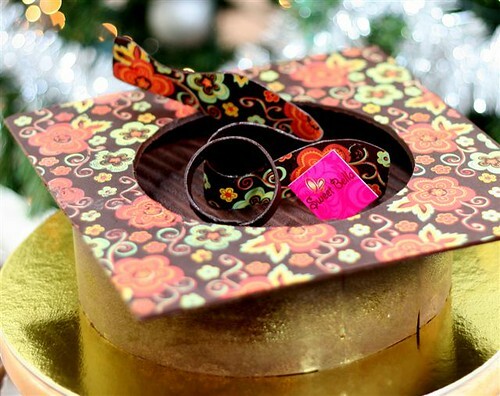 Cristina’s version doffs a jaunty square chocolate “hat” bedazzling in its sophisticated floral design. Tempered chocolate “waves” of the same print dance on a cocoa ripple, and the entire structure is held in place by a chocolate band. Of course it’s what’s inside all that wrapping that’s most ravishing. 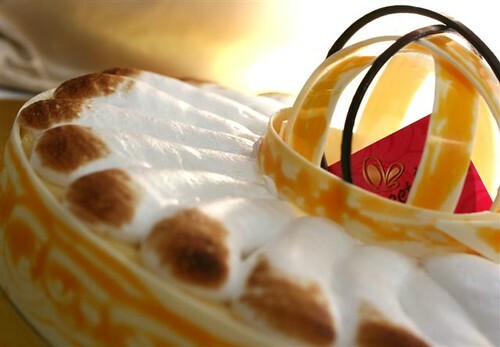 As the name “plaisir” connotes, this sweet consists of hazelnuts, dacquoise ([hazelnut-studded] meringue layers), two kinds of chocolate — ganache and cream softly whipped with chocolate, and praline. Crunchy, slightly sweet ”“ it’s a cake that celebrates flavor, allowing each component to revel in its own flavor, form, and texture. I’ve been known to grab lemons, slice and sprinkle them with salt and then pop the entire wedges into my mouth. I savor sour. When it comes to dessert, if it’s got lemons in it, it’s got to be really lemony. I’m not talking about a citric scream that makes my eyes roll back ”“ a good lemon dessert is all about a matter of taste and doing it right. Cristina’s Lemoncello is a lemon cream pie that’s all grown up. The citrus element ”“ exciting instead of intense — is made just so with cream and egg yolks, while the sugar tempers the sour. It’s fluid smoothness sliding through leaving a lingering lemon layer on the tongue. The lushness of the filling is gently prodded along by the occasional crispness of the pie’s crust and, if you manage to get some onto your fork, a shard of the white chocolate band ”“ its inclusion will make you know the pleasure of what lemon and white chocolate taste like together. absolutely love your sugar series, lori! how much yung Midnight Hazelnut Crunch? Lori, just ordered the Lemoncello for my Sales Team Christmas dinner. The cake left a tart (of course) and mouth-tingling sensation in my mouth, nicely complimented by sweet white chocolate on the side and graham crackers on the bottom. Loved it! I don’t know how I stumbled onto your website but I love it. Everything in the Deember series looks so good.